Shelby was diagnosed on July 30th, 2018. She wants to help turn Type 1 into Type NONE. Our team is SHELBY STRONG! Read more about our journey and why we’d love for you to walk with us on April 13th in Tampa at Amalie Arena. A little update from our family. We choose to share because sharing is powerful. And knowledge is power. Knowledge that I will benefit from because someone out there might be able to help me/us. I am also sharing because I need your help. Especially if you are around our family during school, out of school etc. This is a long post, but if you are this far… grab a cup of coffee and PLEASE READ. Maybe you can help me. I don't get overwhelmed easily, and I am starting to feel the weight of the situation...So this is why I share...and this is why we will walk together on April 13th. Shelby had been loosing some weight this summer. We attributed it to a new house with a pool, a bike-able neighborhood, eating healthy, etc. Then came July. Her energy started to slip. More weight cams sliding off. She was tired all the time. She started to complain of belly aches which we attributed to constipation. Because of her Adrenal Insufficiency, many symptoms were masked as they were actual current symptoms of her already pre-existing conditions . Thirst & frequent urination- were all things that were already present. We had noticed that things weren’t “right” but had attributed it to her levels being off and the current diagnosis. One morning- she threw up. We treated her as we do for adrenal crisis. We went to the doctor. They did some blood tests. Urine tests and determined we needed to go to the hospital ASAP. We did. She was admitted and there was the answer: Metabolic-acidosis. The beginning of Type 1 Diabetes. Holy …. Devastated. Mad. Upset. Terrified. Happy. Relieved. Anxious. Furious. Elated. Nervous. So. Many. Questions. All the feels. All the rage. All the tears. What does this mean? Well,basically we won the rare disease lottery - twice. Three days in the hospital but we finally have a diagnosis. And she’s getting back to normal. Slowly. But surely. My first mission- to make her understand that this didn’t happen because of something she did. Or we did. Nope. It just comes on. Yes- some of it is hereditary but not us. She just won the lottery. Second mission- to tell her and the kids and our entire family, that this will be ok. (By the way- the HARDEST part of this whole ordeal was telling the kids what the diagnosis was. They were just as devastated as they didn't understand. They all were crying. They are all in this with her and learning too...) But we let them know- we can do this. We are raising 3 kids with one rare condition, so the daily medicine and monitoring isn't really new to us. We already give medicine three times a day to the kids, we can just add the new routine in. And life goes on. But there's alot more that goes into this...alot. And let me give you an update on Shelby.... This kid is a rockstar. She left the hospital knowing how to test her sugars, and give HERSELF HER OWN INJECTIONS!!!!!!! What?!?!?!!? Seriously. She’s on to her diet, which really doesn’t need too much modification, but there is so much I/we don’t know yet, which is terrifying. I’m trying my hardest to remain positive, but this is a lot…but we can do this. 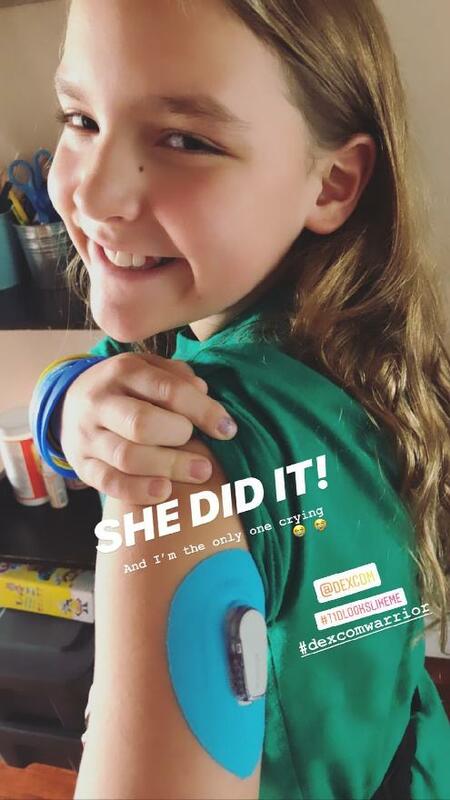 She's testing herself at school and also giving herself her own shots at school too. She doesn't complain. She doesnt' wince at the shots. She is my hero. We are a strong family and we will make sure that she gets the best care and lives her best life. Yes- things will be different and slightly more complex. Now- here’s where you come in. We really walking to raise money to fight for so many others with this condition. Over 40,000 are diagnosed each year with Type 1. Research, medicine, laws, things I never knew existed need to be done to help this every who live with this condition daily. For her and her future. To all my friends and family who love Shelby as much as we do, thank you for the well wishes, the presents, the words of encouragement, and the love that we feel from you all. It’s a tough diagnosis, but she’s back at school like she didn’t miss a beat. Our school has been amazing and everyone has been so supportive. But there’s always a silver lining. It could have been a different diagnosis. It could have been much different. We know that we are never given anything that we can’t handle. And that just means we must be one REALLY STRONG family. We hope to see you on April’s 13th!